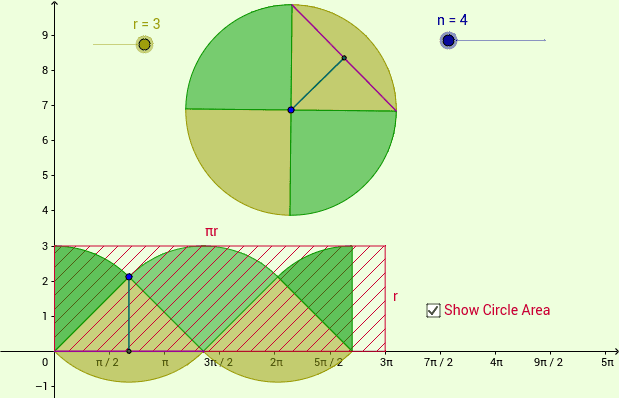 We know that the area of a circle is: A=πr². But this is actually hard to prove. So we cut the circle into wedges and place half of the wedges face-up and half face-down. The hanging-out yellow pieces always "fill-up" the empty areas of the rectangle with A=πr² As the number of wedges increases, the teal line -> radius and the hanging-out pieces start to fit inside the rectangle. Isn't that cool? Showing this mathematically is called calculus! What is the total length of the curved parts of the yellow wedges? Why did we label the x-axis with units of π and the y-axis with units of numbers?